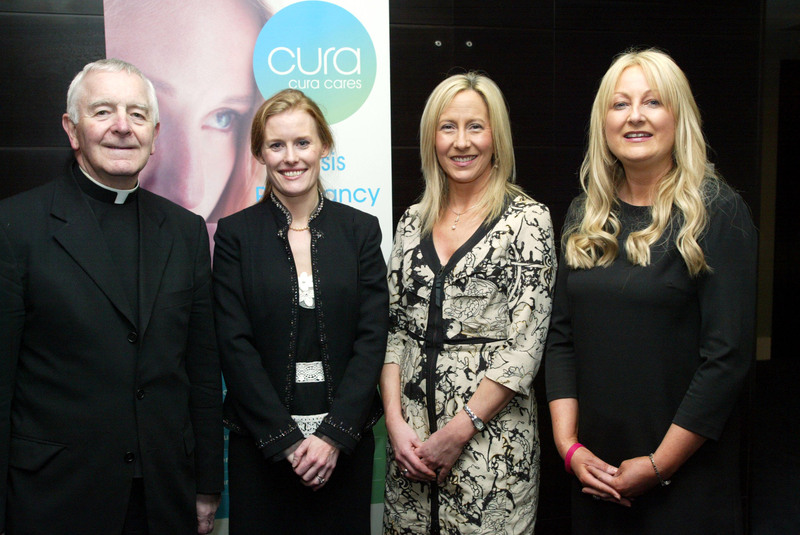 Pictured at the launch of their new Logo and Website during the opening of Cura's National Conference on Friday night were Most Rev. Gerard Clifford, Auxiliary Bishop of Armagh and President of Cura, Stephanie O'Keeffe, Director HSE Crisis Pregnancy Programme Louise Graham, Cura National Coordinator, Catherine Kelly, crisis pregnancy counsellor with Cura Dublin. “If I could share one piece of advice with somebody who is experiencing an unplanned pregnancy it is that they are not alone. 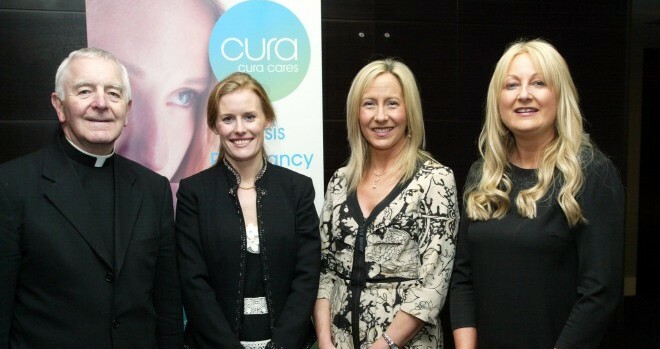 Crisis pregnancy support services agency Cura revealed a brand new look at its 35th annual conference this weekend, having undertaken a comprehensive rebranding process that was officially unveiled as part of the 35th annual Cura national conference at the Sheraton Athlone, Hotel . The rebrand, which incorporated the launch of a brand new website, Cura.ie, was well received by the 150 Cura counsellors and key stakeholders in attendance. Speaking at the official launch of the rebrand and new website, Louise Graham, National Coordinator at Cura said, “This has been a really exciting process for all involved. From the outset, we knew that we wanted to ensure the Cura brand will be seen by the public as relevant, modern, professional and caring and believe that we have successfully achieved this with our rebrand. We are now in a position to move forward confident in the belief that we are now firmly established as one of Ireland’s key crisis pregnancy support service providers. “Our new website, Cura.ie, is both an exciting development for the organisation and important resource for our clients. Because the website is often the first interaction that a person has with Cura, we wanted to create an online hub where visitors to the site can learn more about the range of support services we provide: crisis or unplanned pregnancy support and counselling; pregnancy testing; counselling and support after an abortion; support to mothers and fathers of a new baby; and the Cura Schools Awareness Programme. Catherine’s experience inspired her to give back to Cura: “My son was born in 1985 and is an amazing person. I wanted to give something back to Cura and support others who, like me, had been through the same journey. I started training with Cura as a Crisis Pregnancy Counsellor and went on to college to become a counsellor and physiotherapist. I worked in Wexford for many years. I now work at our Dublin centre. I find our Schools Awareness Programme excellent – looking back at my own journey, I feel our schools could have benefited from this valued service. The theme of this year’s conference was Engaging with Potential and it reflected on Cura’s 35 years of skill and experience in providing crisis pregnancy support services in Ireland. According to Louise Graham, the way this support has been provided over the years has evolved to reflect an ever-changing society, as well as the changing needs of clients, and, looking to the future, it will continue to grow and develop in response to the needs of clients. With this in mind, the 2012 Annual Conference referenced the Strategic Review and Planning process that is currently being undertaken by Cura in consultation with key internal and external stakeholders. This review aims to evaluate how effectively the agency has been in the delivery of support services to clients and identifies ways of improving the effectiveness in delivering these services in the future. Among the key priorities outlined in this review is the need to maintain the high standard of support services provided by Cura, along with ensuring that these services are relevant, consistent and effective in meeting the needs of clients. In doing so, Cura will retain its position as one of Ireland’s key crisis pregnancy support service providers. Bishop Gerard Clifford, President of Cura, said: “This year our focus is on the ongoing work taking place as part of the Strategic Review Process and the rebranding of Cura as part of this process. The objective is to ensure that the work of CURA is clearly communicated and that we use all means of communication to get in touch with the various groups of people who use our services. Through a better use of communications, we will ensure that our message continues to reach clients effectively and efficiently. – Cura was established 35 years ago by the Irish Bishops’ Conference. Cura is funded primarily by the HSE Crisis Pregnancy Programme (CPP) and operates under the mandate of the CPP. Cura is informed by the values of the Catholic Church and does not provide contact details for abortion services. – Cura is a voluntary organisation that provides a wide range of free support services to those who find themselves facing a crisis or unplanned pregnancy. These services include free pregnancy testing; free counselling and support including an opportunity to work out your feelings about your pregnancy; the opportunity to discuss options you wish to explore in relation to your pregnancy; support in telling your partner, family and friends if needed; counselling and support after an abortion; support to the parents of a new baby; practical information on rights and entitlements and a successful schools awareness programme. These services extend beyond the person experiencing the pregnancy and are available to men and other family members. Cura has a nationwide presence and reach, operating 14 dedicated centres around Ireland and a number of outreach centres. There are over 200 trained crisis pregnancy counsellors and 30 post-abortion counsellors working on a voluntary basis for Cura who provide professional, non-judgemental support to help clients make informed decisions without influence or direction.